Home > Updates > Ultrasound Guided Needle BiopsyAn ultrasound-guided needle biopsy is a medical test used to learn more about a lesion or mass. The biopsy is done by using an ultrasound to find the lesion or mass. This is one type of "image-guided" biopsy, which combines the use of ultrasound with either a Fine Needle Aspiration or Core Needle Biopsy.This test is most often used for lymph node, breast, and liver biopsies. This test can also be used with endoscopy or bronchoscopy when tumors are within the GI tract or the lungs. These are known as endoscopic ultrasound (EUS) or endobronchial ultrasound (EBUS). Ultrasound Guided Needle Biopsy An ultrasound-guided needle biopsy is a medical test used to learn more about a lesion or mass. The biopsy is done by using an ultrasound to find the lesion or mass. This is one type of "image-guided" biopsy, which combines the use of ultrasound with either a Fine Needle Aspiration or Core Needle Biopsy. This test is most often used for lymph node, breast, and liver biopsies. This test can also be used with endoscopy or bronchoscopy when tumors are within the GI tract or the lungs. 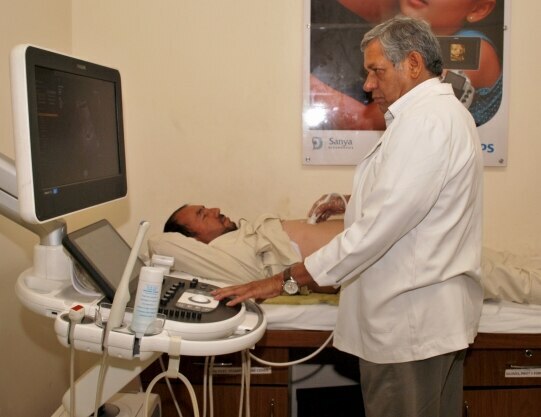 These are known as endoscopic ultrasound (EUS) or endobronchial ultrasound (EBUS).